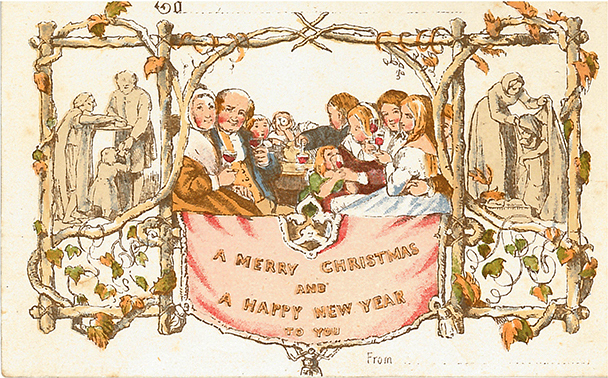 The Cole/Horsley card of 1843 is generally accepted as the first Christmas card printed for public sale. The card shown here is a reproduction of the Cole-Horsley card published by Thomas De La Rue in 1881, series 459. Our modern day greeting card can trace its origin to a card printed in December 1843. At Christmas time Sir Henry Cole, first director London's Victoria and Albert Museum, would hand write greetings and best wishes to his family, friends, and acquaintances. He and other well-wishers could buy sheets of paper decorated with Christmas themes or generic holiday cards to which the specific holiday could be added. This got to be a cumbersome task, so he asked a friend to produce for him a Christmas card with a single message that could be duplicated and sent to all on his list. John Calcott Horsley, an artist friend of Cole and member of the Royal Academy, was commissioned to design the card to be used by Cole and sold to the public. 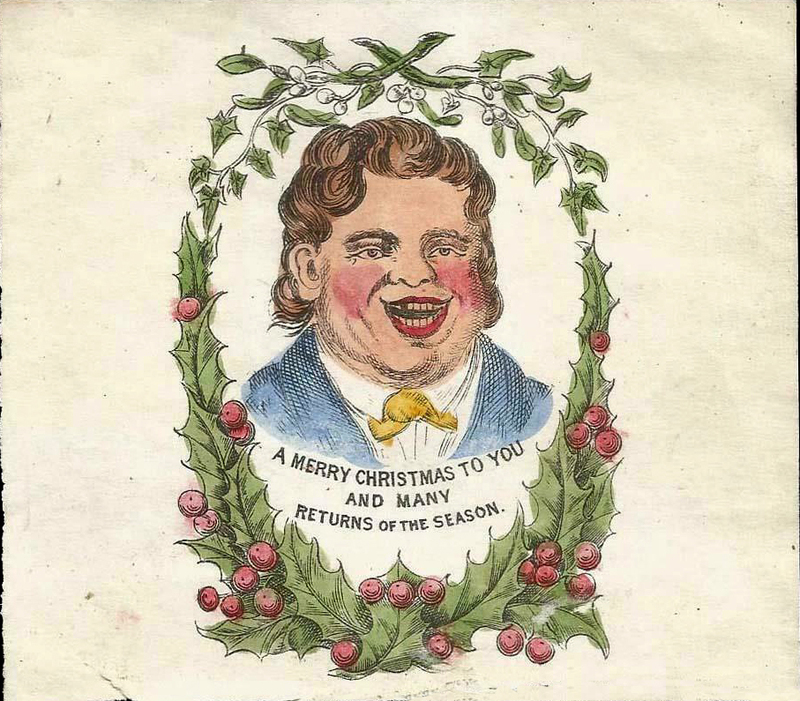 He lithographed and hand-colored 1,000 copies of this 'first commercial Christmas card', of which only 12 are known to still exist. The card was issued from the office of 'Felix Summerly's Home Treasury', a periodical in that time. Those he didn't used were and sold from a local shop for one shilling apiece. The card was three by five inches (8 X 13cm) and depicted three scenes. The center panel portrayed a family of three generations gathered around a table drinking wine with the Words "A MERRY CHRISTMAS AND A HAPPY NEW YEAR TO YOU" written across a banner covering the bottom half. This expression would become the standard sentiment of the season on Christmas cards. The left panel illustrated feeding the hungry and the right panel was clothing the naked. This caused such a stir with the public that the cards were withdrawn from sale. But the practice of sending cards caught on in England aided by the passage of the Postal Act of 1840, which allowed a piece of mail to be sent anywhere in the United Kingdom for one penny. Prior to the "Penny Post", postage was based on mileage and paid by the recipient upon delivery. With the postage act, the sender could pay the postage at a single rate. In 1844 another Christmas card was introduced for public sale symbolizing the 'Spirit of Christmas'. This one was produced by W.C.T. Dobson and sold many more than Horsley's card had the year before. The novelty, and convience, of Christmas cards began to catch on. Just a few years later, in 1848, W.M. Edgley produced a card similar to Horsley's, with much the same rustic frame of gnarled wood and ivy. However, this card had the first inclusion of holly on a Christmas card. The greeting was the same but used the archaic spelling 'Christmass'. These two cards are the oldest cards in the G.Livaudais Christmas Collection. 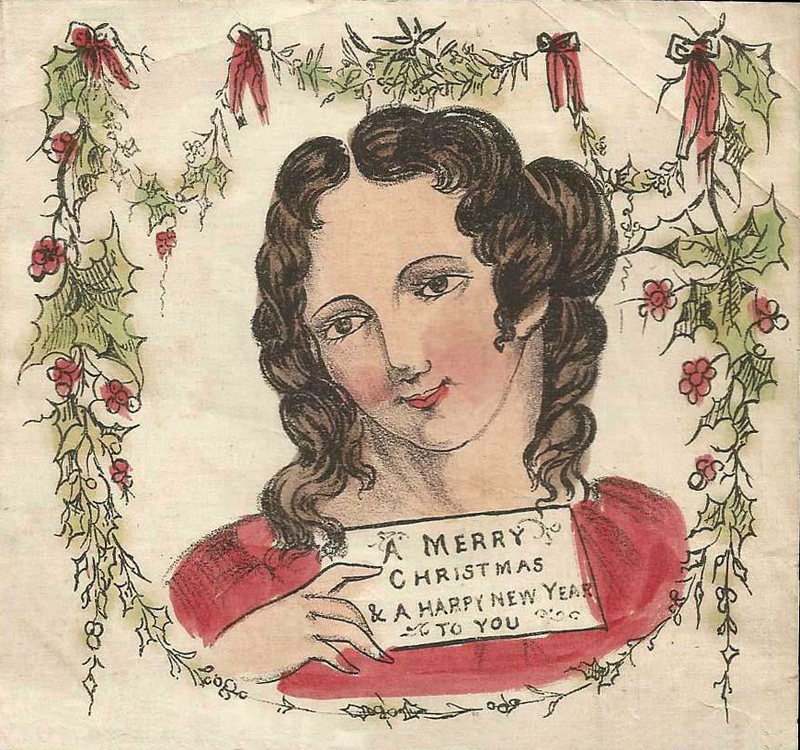 They are dated to the 1840s, just a few years after the first Christmas cards were created. The lady on the left with the slight smile is a typical design of the Victorian era, as is the laughing gentleman on the right. The colors are hand tinted. Both are about 4.5" wide.